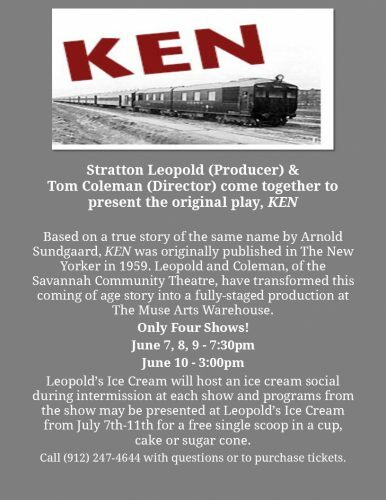 The Savannah Community Theatre proudly presents the original play, KEN, produced by Stratton Leopold and directed by Tom Coleman. KEN is based on a short story of the same name by Arnold Sundgaard and was originally published in The New Yorker in 1959. The story is the true account of a life-changing train ride taken by Sundgaard in 1933 while he was a self-involved acting student at the Yale Department of Drama. When a fellow student by the name of Ken Stevens dies, he is asked to accompany the boy’s body back to his parents’ home in Portland, Oregon. The story centers around his trip, the woman he meets on the train, the loss of Ken’s body, and the funeral that follows. Events that ultimately changed Sundgaard’s life forever. The fully staged, re-written production of KEN, a Savannah premiere, will have a four day run at The Muse Arts Warehouse (703 Old Louisville Road). 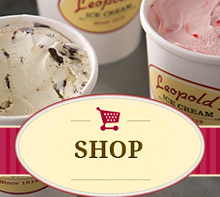 Leopold’s Ice Cream will host an ice cream social during intermission at each show. Show times are 7:30pm July 7, 8 and 9 and 3:00pm July 10. Tickets are $15.00 in advance and $20 at the door. For advance reservations call 912-247-4644 Mon-Sat 10:00 am to 6:00 pm. The box office will also be open 30 minutes before each performance. Your ticket purchase will help offset the costs of this fully staged production. Stratton Leopold is an ice cream entrepreneur, a Hollywood movie producer and a community leader. Stratton was born and raised in Savannah, grew up in the ice cream business under the guidance of his father and uncles and has since traveled the world for more than 40 years making major motion pictures. « 6th Annual I Pledge For Ice Cream Kicks Off At Leopold’s Ice Cream!